Currently my "Trigger's Broom" of a touring bike (only thing original on my '08 Dawes Horizon is the frame and fork) is shod with a pair of Marathon Greenguard. Pretty basic tyres, but not particularly comfortable either, probably due to the 3mm rubber "greenguard" layer beneath the tread. Main use of the bike this year will be the massive commute of 1.3 miles each way to work and back, and some general day rides, possible some overnight B&B tours. Seeing as this bike hasn't had much spent on it recently, I thought it deserves a treat. So what's recommended in the way of reasonably light weight "touring" tyres, which aren't too heavy duty, and still reasonably "plush", but not to fragile either ~ 700x32 to 700x38 or thereabouts. I had tried Panaracer Paselas in the past. Nice tyres, but these failed with perished sidewalls. HK loves her 700x38C Schwalbe Almotions. Expensive but performing well. I'm massively impressed with Marathon Supremes (and I'm one of those who hate the stiff regular Marathon and Marathon Plus tyres), have been running the 32mm folding version on my Hewitt Cheviot for about 4 years now (obviusly not the same set...). For a touring tyre I find they seem fast, are relatively light and provide a nice road feel (unlike regular Marathons/Pluses) and are still relatively very puncture proof - have only really had punctures when the tyres have been close to wearing out. I've used them for year round commutuing and touring, but even on some club rides and sportives. No complaints. For touring comfort the Paselas take some beating they just are a bit magic carpet. They are however, prone to deflation, particularly sidewalls. I've had schwalbe Spicer tyres on mine. Basically cheaper and look lighter marathons (£15 each), might be perfect for you. Not sure the Spicer are that much lighter than my 32mm Marathon greenguard though. I was going to mention Spa have them on offer, but you're already there. I've never seen that wired version they have for £20 anywhere else, I have some and they're fine, but as they also have the previous model folding version for £25 I think I'd spend the extra. Indeed, probably as well to go for the folding version for an extra fiver a tyre. To me £25 a tyre is about maximum I'm happy to spend. Yes I think I have it wrong, looks as if they are heavier. They're gooduns in my experience though and very good VFM. Schawlow CX Comp might fit the bill. They’re dead cheap, work great on tarmac and I don’t think I’ve ever had a puncture while using them. They are dead as a very dead thing to ride. I use them as winter tyres when there is snow around, and only then. I am very glad when I change back to lighter slicker tyres, the bike rides so much easier. The question is about summer touring tyres. No good to the OP because I use 28 but I like Michelin Pro 4 Endurance. Some years ago I used Panaracer Paselas and quite liked them. I fitted some 33mm Jack Brown Blue's on my work bike recently. 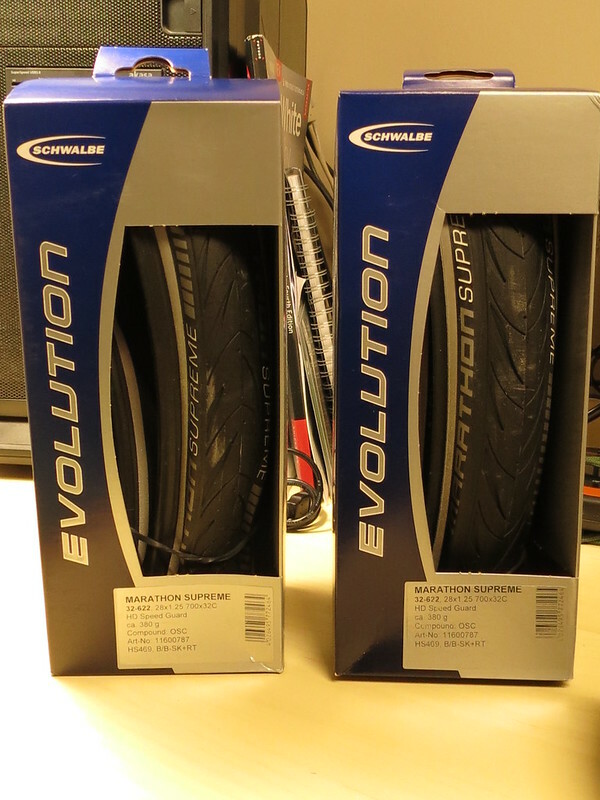 Most soft feeling, comfortable tyres I've ridden yet. £20 at Planet X. Described as a touring tyre they are apparently pretty decent for longevity and puncture resistance from the reviews I've read (I stuck a few ml of Stan's in the tubes to be on the safe side). I'm loving them so far. Only drawback is they were a bit of a nightmare to get on my rims. I find the Supremes fine on light off road, they're certainly robust enough and IMO it's only in a narrow band of circumstances where a light tread makes any difference. If you are looking for a Marathon like tread in a lighter tyre, the Paselas already mentioned are good, they were my default tyre for a decade or so, mostly the TG version, I haven't noticed any less grip since I changed to Supremes. Apparently made by panaracer? The sidewalls do look rather fragile though. Well, that's the 32mm Folding Marathon Supreme ordered from Spa Cycles, £25 each I think they are an older version of the Marathon Supreme, but can't complain for the price. I only hope they are in stock as it says on the Spa website.. I'm sure they will be more than adequate for the "off road" cycle paths I'll be using. I'm pretty sure If I had went for something more "off road suitable", I'd have been disappointed with the road performance. Supremes are a smashing tire. comfortable, pretty fast rolling , puncture resistant, easy to fit and better off road than claimed. you can't go wrong. Useful reflective strip on sidewall too. Don't by the old model though. All the gear and no idea.Three dimensionally dyslexic. Why not the old model? Anyway hopefully I'll be getting a pair of the old model delivered today. £25 a tyre certainly more wallet friendly than £35+ a tyre. Lol, I've only just opened up the package from Spa cycles. Planet X are selling the excellent Vittoria G+ Revolution for £8 right now. I've had these tyres on my deliveroo bike since last March. Done approx 5000 km on them and not one visit from the fairy.